Modern diets and the environment, due to hormone disrupting chemicals, can throw hormones out of balance as these glands try to regulate bodily processes like puberty, menopause, sexual function and reproduction. The result can be negative symptoms, such as hot flashes, PMS, cramps, bloating, headaches, anxiety, irritability and exhaustion. 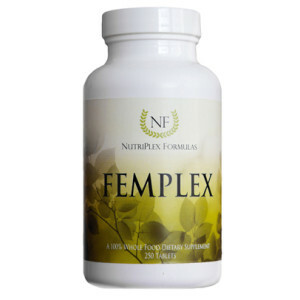 FemPlex gently offers female hormonal glands the nutrients that allow them to function optimally. Excellent for female health, hormones & more! In addition to the unique properties, synergists and cofactors of this food, each serving provides the following nutrients contained within the above food-nutrient blend (not as isolates): Vitamin A, Vitamin B, Vitamin C, Vitamin E, Essential Fatty Acids, Iron, Potassium, Calcium, Magnesium, Manganese, Selenium, Zinc, Phosphorus, Copper, Antioxidants, Bioflavonoids (especially Rutin), Trace Mineral Activators, Enzymes, Chlorophyll, Trace Minerals, Amino Acids, Phytoestrogens and more. Does not contain hormones, but rather precursors to support the body’s production of hormones. 2 tablets daily, or as directed by a healthcare practitioner. Not intended for pregnant or lactating women, or females under the age of twelve, without consent of a physician. Difficult menstrual periods with cramping, headaches, excessive bloating and irregular bleeding may point to disruption of the female hormonal system and other supportive systems. Refined sugar and coffee, for example, may leach minerals out of the cells and set off a chain reaction of mineral and vitamin deficiencies. Altered and processed oils commonly disrupt hormonal balance and glandular function. The foods and herbs in FemPlex are designed to bring real nutrients into the body to support females at the cellular level. Therefore, in addition to supplementation with FemPlex, an eating regimen to “clean up” the diet and bolster immune system function is prudent. As “weak estrogens,” having 1/50,000 the potency of a dose of synthetic estrogen, certain bioflavonoids (contained within the foods in FemPlex) help to regulate estrogen levels, as they contain compounds that bind to estrogen receptors and act as a substitute form of estrogen in the body — especially beneficial when the body is no longer producing adequate supplies.